Paul R. Young, Sr. was a beacon in his community and an everyday hero to his family. He had a servant's heart and was always actively involved in the community that he loved. Paul R. Young Funeral Homes is proud to carry on the legacy of its founder, Paul R. Young, Sr. (1921-2013). Paul's beloved wife, Marian, who founded the business with him in 1948, still owns the funeral home. Paul served as president until his passing in March 2013, and Marian now honors his legacy and serves as president in his stead. 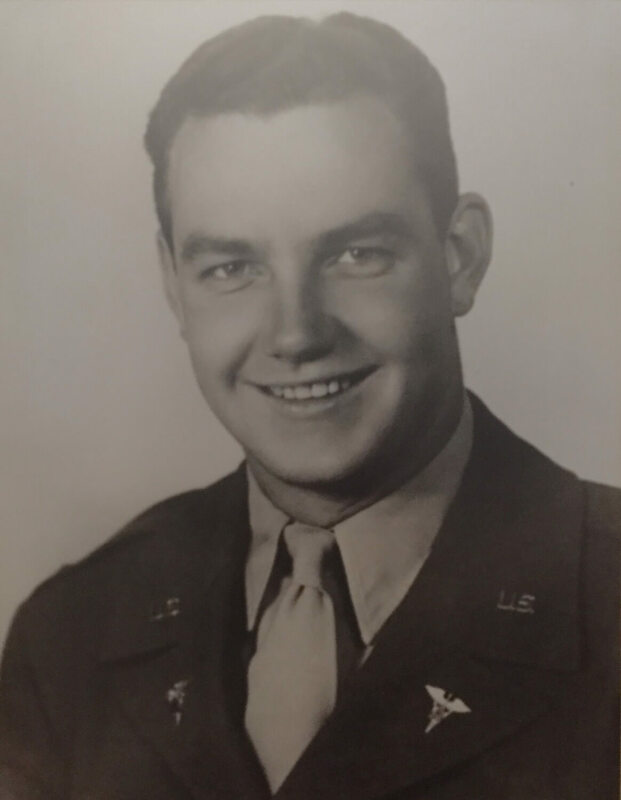 Paul R. Young, Sr. was born in 1921 in Camp Washington to Lena and Robert Young, but he was raised in Dunlap and attended Colerain High School with his brothers Robert, George, and Charles. He was a member of the school's first football team at Colerain and was later inducted to the school's Hall of Fame. In 1938, while still in high school, he was honored to serve as the Lieutenant Governor of Buckeye Boys State in Ohio. It was also in high school that he met his future wife, Marian Mack, also of Dunlap. After high school, he attended the Cincinnati College of Mortuary Science to become a funeral director; his training there provided him with skills that would later serve him as a medic in World War II. When he graduated college in 1942, he received his draft letter from the United States government, calling him up to service in the US Army. Two weeks later he reported to Ft. Thomas in Kentucky to be inducted, then he served his basic training at Ft. Bragg in North Carolina. From there, he departed for Europe. Paul served as a Lieutenant with the US Army during WWII in England, Belgium, Germany, France, and Czechoslovakia. He was a medic in the Battle of the Bulge and in 1945 received the rare and extraordinary honor of a Battlefield Commission while serving in Germany. He was first in a small group of soldiers at the liberation of the Buchenwald concentration camp and among the first cars to free occupied Paris. He was decorated with the WWII Victory Medal, American Campaign Medal, Meritorious Service Unit Award, European-African-Middle Eastern Campaign Medal (also originally know as the EAME Ribbon), two Silver Stars, three Bronze Service Stars, and the Good Conduct Medal. After the war, he was granted special permission by his general and Madame Tussaud's Wax Museum to study sculpture under Bernard Tussaud, nephew of famed wax museum artist Madame Tussaud, in London. His sculptural studies served him well in his career and he was known for his restorative artistry. After returning home and starting his business, he studied special sculpturing at the Cincinnati Art Academy from 1948 to 1951. This was also when he first began creating and displaying his famous Christmas scene of life-size wax figures on the front lawn of his business in Mt. Healthy. Upon returning from the war, Paul began his career as a funeral director and also married his high school sweetheart, Marian, on May 25, 1946. He served his apprenticeship with Hawthorne Funeral Home and also worked in various funeral homes across the southwestern Ohio region. Paul and Marian were finally able to purchase a home for their family and start their own business in 1948. The beautiful Mt. Healthy home was built in 1833 as a family home, predominantly for the LaBoiteaux family, and was purchased by Paul and Marian as their home and business. After starting his business, Paul continued to serve as a trade embalmer for other local companies while he and Marian focused on building their company and serving their community. He also furthered his education early on and attended Southern Ohio Business College from 1952 to 1954. Early on in his career, Paul began a project for his community that represented his faith, devotion, and love for his Savior. He created a life size Nativity scene sculpted out of wax that depicted the birth of Christ; it became a life-changing tradition for many in the Cincinnati area. Drawing on his experience and artistic training in London, Paul sculpted Mary and Baby Jesus out of wax. For his first Christmas display, he built a manger replica with barn wood and placed Baby Jesus in a trough bedded with straw as Mother Mary looked on; Joseph was added the following year. Several years later he remade Mary, Joseph, and Jesus, and added wise men, shepherds, live donkeys, and live sheep. The likeness of the figures of the Christmas scene were based on family members and residents of Mt. Healthy. For over sixty years, the birth of Christ the Savior has been depicted on the front lawn of Paul R. Young Funeral Home in Mt. Healthy at Christmastime. Displays were also later added to the Hamilton location on Pleasant Avenue and also to Paul's brother's business, Charles Young Funeral Home, in Ross on Hamilton-Cleves Road. The Christmas display was an expression of faith to his Lord and Savior, the Christ Jesus, and was a gift of love to the community to which he was devoted. Paul and Marian raised their family in Mt. Healthy where he was also very active in the community. He served as the first president of the Mt. Healthy High School PTA and was vice-president of the Mt. Healthy Board of Education from 1964 to 1967; in 1968 he received their Certificate of Service for all of his years of hard work. He was a member of the American Legion Wesley Werner Post 513 for over sixty years where he served as a Commander and was also the Parade Chairman for many seasons. He was honored by his local post in 2005 for his years of service. He was also a member of several organizations including the Mt. Healthy Chapter #365 OES, Masonic Lodge #120 F&AM, Scottish Rite, Cincinnati Syrian Shrine, and charter member of the Colerain Kiwanis Club. Paul and his family were long-time members of Heritage United Methodist Church, where he was Education Director in 1949. Later in life, he also served as a trustee/director for the Christian Benevolence Association Foundation for the Aging from 1998 until 2012, and was inducted into the CBA Senior Adult Hall of Fame in 2005. Paul was a devoted professional and committed to the integrity of the funeral home industry. In 1949 he served as the president of the Cincinnati Funeral Directors Association and was a continued member of the CFDA, the Ohio Funeral Directors Association, and the National Funeral Directors Association. His experience as a funeral director, embalmer and anartist led to a professorship with the Cincinnati College of Mortuary Science where he was the head of the Restorative Art Department and also taught the Psychology of Grief for several years. He maintained good relations with the college throughout his career and later would take on student interns from the college, as well. The business continued to grow and expand as Paul turned his eye to the north and west. In 1953, he purchased land in Ross from a family friend who also a soloist at Paul and Marian's wedding in 1946. There, on Hamilton-Cleves Road, he built a home and funeral home which he later sold to his younger brother Charles. A small Nativity scene sculpted by Paul is still on display of the front lawn of the Charles Young Funeral Home at Christmastime. Ten years later, in 1963, Paul purchased the Griesmer-Grim Funeral Home in Hamilton. In time, the Hamilton office relocated to the Pleasant Avenue home, where it still is today. The addition of the funeral home in Hamilton brought Paul's commitment to service and his community to a more northern greater Cincinnati population. Another small Nativity scene was completed and added to the Hamilton front lawn at Christmastime. In 2009, Paul purchased the funeral home in Oxford, which is now the Ogle & Paul R. Young Funeral Home, once again expanding Paul's commitment and service northward. Harry Ogle, the previous owner, still works the Oxford funeral home today and his family name holds joint title with Paul Sr. in the business name. As the business grew, so did the popularity of the Nativity scene. The Cincinnati Zoo took notice and asked if Paul would be willing to donate a manger scene that matched the Mt. Healthy display in scale and content to the Cincinnati Zoo Festival of Lights celebration. He was indeed willing and he went to work to create another life-size manger scene for the local zoo. The scene debuted at the Festival of Lights in 1990 and was on display at that location for several years. The Christmastime display in Mt. Healthy began to grow in the 1990s with the addition of a life-size wax Santa Claus on the front porch, sculpted by Paul's son, Paul Jr. Sleigh rides for the community were later added to the Christmas display in homage to the pony and sleigh rides that Paul Sr. enjoyed with his young grandchildren when there was ample winter snow. The business celebrated its fifty-year anniversary in 1998 with a reflection of two generations of service and contribution to the community. The business celebrated a legacy of giving, grace and a devotion to faith, family, and community that resonated through every aspect of the business. Over the years, Paul R. Young Funeral Home received several awards from the city of Mt. Healthy and Cincinnati. The business was recognized by the Greater Cincinnati Beautification Committee and received the Beautification Award in 1971. Paul was also a member of the Mt. Healthy Historical Society and he enjoyed sharing the home's history with others, especially at Christmastime. He was the designer of "Christmas in Mt. Healthy" and would hold Christmas events with an open house and publications. He loved his home and business in Mt. Healthy and enjoyed sharing its loveliness with the community. All through the years, Paul's hard work and service did not define him but were rather the natural products of his character. He went the extra mile to show kindness and display God's love. He didn't grow weary in his service and was constantly refreshed because he didn't work for work's sake, he worked for Christ and for those that he loved. Consistently throughout his life, he was compelled by love. It is through his example that the business continues under the leadership of his beloved wife, Marian. We may tire occasionally but, like him, we are replenished when we work as unto the Lord and desire to help meet the needs of our community. "And whatsoever ye do, do it heartily, as to the Lord, and not unto men; knowing that of the Lord ye shall receive the reward of the inheritance; for ye serve the Lord Christ."